A group of 10 invited artists were offered the opportunity to observe the qualities, techniques, composition and other aspects of important drawings of the past, with a view to raising awareness of this vital tool in the artists’ practice. Artists were challenged to observe and copy the Old Masters’ drawings and later translated the techniques studied in a life drawing session lead by an experienced drawing tutor. This first residency aimed to inspire the artists to spend time looking at drawings of the past more critically and to apply their experiences and their observations in their own practice. After an introduction to the British Museum’s collection, Sarah Jaffrey, Project Officer for the Bridget Riley Art Foundation at the British Museum, presented the artists with a selection of drawings including pieces by Michelangelo and Rubens. Tutor Jo Volley from the Slade School of Art led an observation drawing session during which the artists copied the drawings that most inspired them. At the Townley Collection, Celeste Farge, Prints and Drawings Cataloguer (Paul Mellon Centre), and Kate Morton, Illustrator, talked about the Townley collection as well as its representation throughout Art History and invited the artists to explore the collection with a guided tour. 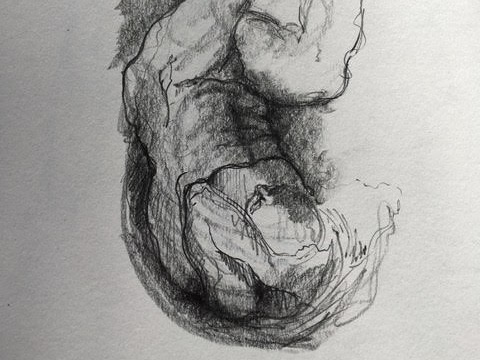 For the last workshop, Jo Volley lead a life drawing session, with model, inside the Prints and Drawings Room of the British Museum which gave the artists the opportunity to study the body in an unusual setting. Ketty Gottardo, Martin Halusa Curator of Drawings at the Courtauld Institute of Art, generously introduced the Courtauld’s collection as well as the selection of drawings for the day’s study. The drawing selection included notably works by Géricault, Guercino, Constable and Tintoretto. Tutor Dilip Sur, from the Royal College of Art, then led an observational drawing session focussing on techniques. Later, Sur lead a life drawing workshop with model in the Courtauld Institute of Art Seminar Room. Martin Clayton, Head of Prints and Drawings at the Royal Collection Trust, Windsor Castle, introduced the RCT collection to the artists as well as the drawings selected for the session. The drawings presented varieties of style between North and South Europe as well as the diversity of techniques. Tutor Rebecca Cartwright de Fontenelle led a session on he observation of the drawings in the collection and later she conduced an intense life drawing session with model which included poses from 15 seconds to 1 hour long.